Relax in the care of our fully qualified stylists, all of whom are trained to the highest standards by Wella. We offer complimentary consultations, time to listen, discuss and advise on all styles and colouring techniques. 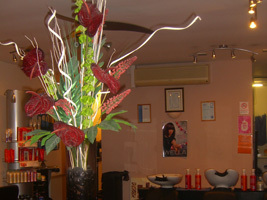 Our team at Hairporium provides a friendly, professional & caring service. Why not visit our salon and spend some time with one our professional stylists to discuss your next hair colour. It is so important that you get the right colour to make the most of your complexion and accentuate the colour of your eyes. By using the latest colour boards we will be able to tailor your colour to perfection. No appointment necessary. N.B - Skin test 24 hours prior to any colouring service needs to be applied. If your colour has gone wrong, visit our experienced colour technicians to take corrective action and leave you with a colour that you REALLY wanted. We also offer all other standard hair services.